"I got in from work one night and wanted something a little lighter. I had some frozen chicken breasts and fresh veggies. I added the spices at random and it turned out really good, I thought. There were no complaints from the others either." Arrange chicken breasts on a baking sheet; spread carrots, bell peppers, celery, green onion, and parsley around chicken. Drizzle olive oil over chicken and vegetables; season with salt, Italian seasoning, chili powder, lemon pepper, and black pepper. Bake chicken breasts in the preheated oven until no longer pink in the center and juices run clear, about 30 minutes. An instant-read thermometer inserted into the center should read at least 165 degrees F (74 degrees C). 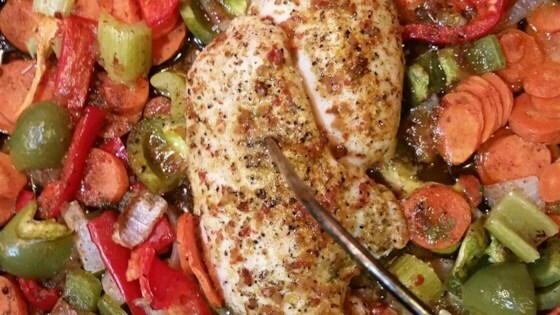 You can throw together your favorite vegetables in this flavorful chicken dish! This is a great week night recipe. I sautéed the vegetables in a pan before I put everything in the oven. The vegetables had the right amount of tenderness. I will make this again. Good flavor and I liked the concept, but the chicken cooked more quickly than the veggies. Veggies were too crunchy and needed to be cooked longer. Brine the chicken breasts in warm water and 1/8-1/4 cup kosher salt before baking. The chicken falls apart. I broiled on top of the veggies 5 min each side after cooked for 25 min. Great base recipe with so much room to suit your own taste. i needed to add a ton more spice, but obviously thats just personal taste. Will make this often! The only thing I would change is to reduce the salt. Husband loved it and especially the vegetables.